For the past 30+ years, Arts and Crafts enthusiasts, including new collectors, veterans, curators, craftspersons, authors, builders, architects, designers, editors, and bungalow owners, have traveled to the Grove Park Inn in Asheville for the annual Arts & Crafts Conference and Antiques Show in February. The three-day conference is usually a sellout, with 1,500 attendees and more than 2,000 tickets sold for the antiques and contemporary crafts show. And winter is a great time to visit Asheville. Education of the Arts and Crafts collector has been the goal of the annual gathering since the beginning. The event is unique for its full range of offerings for the passionate collector and those interested in the Arts and Crafts period. The three-day agenda includes lectures, small group discussions, special exhibitions, book exhibits, a contemporary crafts show and the finest of the antiques shows devoted to the Arts and Crafts period. Dealers not only show their wares (both old and new) but also participate as lecturers and small group discussion leaders, generously sharing their knowledge with attendees, who range from entry level to mature collectors. Reserve your tickets and room reservations early. Grove Park and most of the nearby bed and breakfast inns sell-out. There are three choices for tickets. 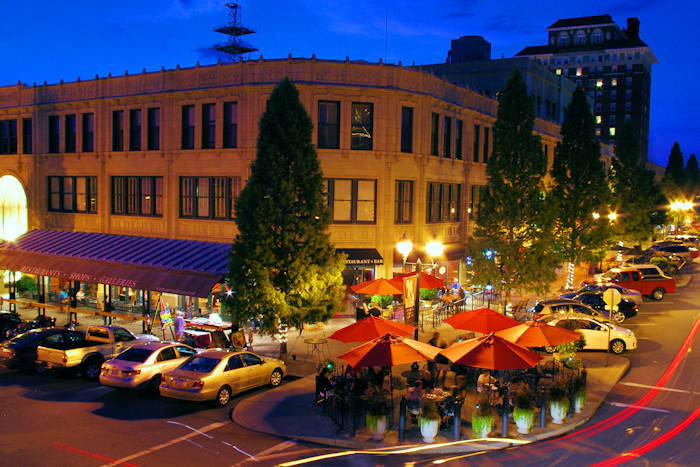 For those who want the complete Arts and Crafts experience, including a room at the Grove Park Inn and entry to all of the seminars, tours and discussion groups, the Grove Park Inn (800-438-5800) has an Arts & Crafts Weekend Package. Those who plan to stay elsewhere, but want to enjoy three days of seminars, demonstrations, tours and discussions, as well as entry to the shows each afternoon, can purchase just the three-day Seminar Package ($150) through Bruce Johnson's office (828-628-1915). 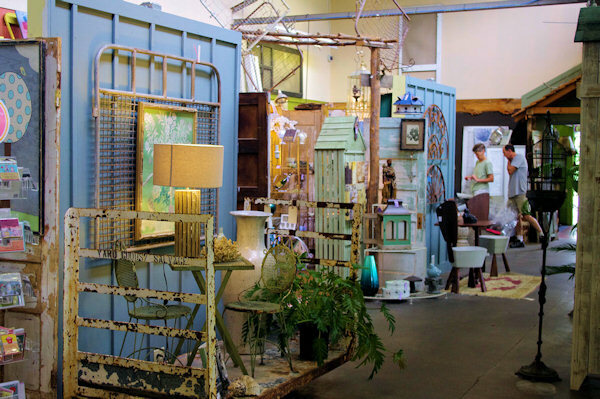 Those who only want to shop the booths of 125 exhibitors selling furniture, pottery, metalware, jewelry, artwork, lighting and textiles each afternoon can buy a ticket good for all three days for $10 at the door. See the agenda & more info on the event website. The three selling shows will be open on Friday from 1-6 PM; Saturday from noon until 6 PM; and Sunday from 11 AM until 4 PM. After meeting you at the north fireplace in the Great Hall, Sue will take you on an informative journey through the Grove Park Inn and back in time. You'll discover why the elevators are hidden inside the fireplaces, and where F. Scott Fitzgerald lived for two years - and nearly died. You'll climb up to the Palm Court - the hotel's hidden lobby - and learn about their ingenuous ventilation system and see how the original Arts & Crafts stencils were uncovered and restored. Also tour nearby Biltmore Industries, begun in 1901 as a woodcarving class for the sons of Biltmore Estate workers and grew to include the weaving of homespun cloth on oak looms, carving bowls and bookends and building handmade furniture. Read about other Asheville area art shows and events. Founded in 1988 by author, collector and former high school English teacher, Bruce Johnson, the Arts & Crafts Conference and Antiques Show has been recognized for more than two decades for its dedication to the education of the Arts & Crafts collector. 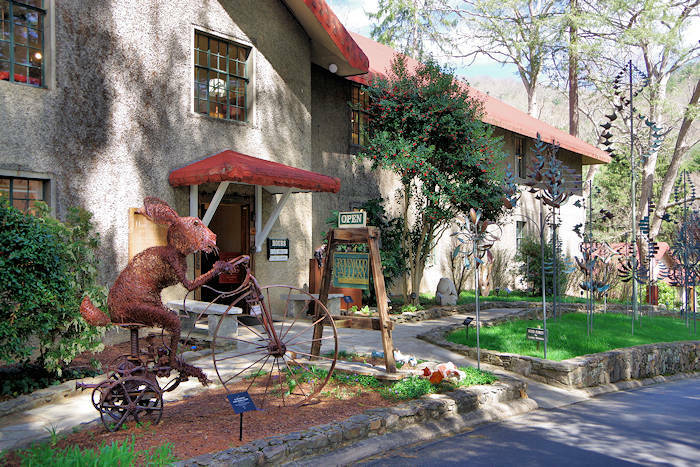 Each February Johnson brings to the Grove Park Inn the foremost authorities, authors, dealers, publishers, speakers and craftspersons from across the country - all assembled each year in one historic hotel for one historic weekend. New collectors learn more here in one weekend than they can in an entire year anywhere else. And experienced collectors keep coming back to renew treasured friendships and to increase their knowlege and appreciation for the Arts & crafts movement. Recognized for its emphasis on the education of the collector, this conference has set the standard by which other Arts & Crafts events are measured, providing collectors with the opportunity to see more, learn more and do more in three days than most of us could in an entire year. The seven seminar presenters arrive knowing that they will be speaking to one of the most demanding - and appreciative - audiences they will ever face. The leaders of the numerous Small Group Discussions are so enthused about their subject that they often volunteer months in advance. And this is not 'just another show' for the 125 antiques dealers and craftsfirms. Most of the exhibitors spend months assembling their inventory for this show, for with a limited amount of booth space, they know they have to bring exactly what you are looking for - and at a price you can afford. Regardless whether you are looking for new or old, this is a buying show. The Books, Magazines and More Show continues to grow in popularity. Here is your opportunity to get autographed copies of new Arts & Crafts books, find out-of-print reference books or one signed by the prolific Elbert Hubbard himself. When The Grove Park Inn opened in 1913, it was hailed as "the finest resort hotel in the world." 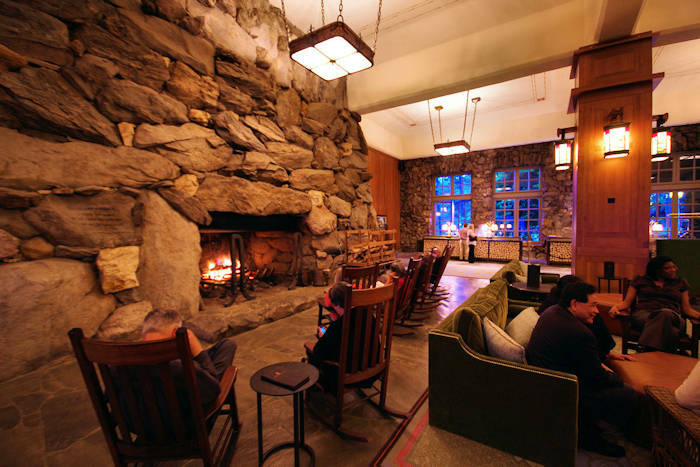 Illuminated with hundreds of Roycroft lighting fixtures and furnished with Roycroft chairs, tables, sideboards and servers, the Grove Park Inn was - and still is - a mecca for Arts & Crafts enthusiasts. The 142 original rooms in the Main Inn have been carefully restored to retain their Arts & Crafts flavor, as well as most of their original Arts & Crafts furnishings.